West works best but anything WNW to WSW is flyable. The road up the hill to the flying area goes through private property and right past a residence. Please drive slowly on the way up, don’t stir up any dust, don’t damage any drainage berms, and haul out all your trash. Smooth grassy slope rises almost 300′ above the valley floor at a 35-45° angle. There are plenty of landing options and slope recovery is relatively easy. 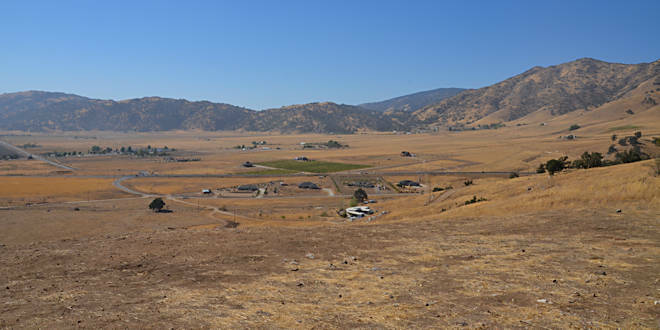 This hill is known as Convict Hill by the locals because it overlooks the California Correctional Institution in Cummings Valley. Go 0.1 mi. E on Cummins Valley Rd, to Rowe Ave. (dirt) and bear right. Go up the hill aprox. 3/4 mi. (1/4 mi. past the last residence) to the top of the slope. 35.14144,-118.46738 = Junction Barstow-Bakersfield Hwy (CA-58) & Tucker Rd. 35.12433,-118.46777 = Junction Tucker Rd. & W. Valley Blvd (CA-202). 35.13151,-118.56794 = Junction W. Valley Blvd, & Cummings Valley Rd.